Emergency Services provides the following seasonal information, from Christmas lighting to tubing bans, to help keep you safe. In Boulder County, if it flies or explodes, its ILLEGAL! Fire bans can be enacted either by the Sheriff or the Board of County Commissioners when certain outdoor conditions are met. It is CRITICAL that visitors and residents alike do everything possible to prevent fires of all kinds. Please do what you can to protect our beautiful lands, homes and wildfire areas from the devastating effects of wildfires. For restrictions on agricultural land see ORDINANCE NO.2014-1. When the area river and stream water levels are high because of heavy rains or snow melt run-off, the Sheriff may implement a Tubing Ban. CRS: 33-13-111. Whitewater canoes and kayaks are exempt from the ban. 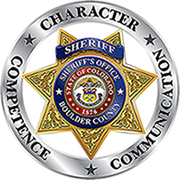 The Sheriff’s office investigates structure fires that occur within unincorporated Boulder County to find the cause and origin. They are also involved in the investigation when it is found that a crime may have occurred. Artificial snow sprays can irritate lungs if inhaled. To avoid injury, read container labels; follow directions carefully. Discard damaged sets or repair them before using. Place candles where they cannot be knocked down or blown over. Never leave candles unattended. Wear gloves while decorating with spun glass “angel hair” to avoid irritation to eyes and skin. Choose tinsel or artificial icicles or plastic or non-leaded metals. Leaded materials are hazardous if ingested by children. Before lighting any fire, remove all greens, boughs, papers, and other decorations from fireplace area. Check to see that flue is open. Keep a screen before the fireplace all the time a fire is burning. Use care with “fire salts” which produce colored flames when thrown on wood fires. They contain heavy metals which can cause intense gastrointestinal irritation or vomiting if eaten. Keep away from children. When making paper decorations, look for materials labeled non-combustible or flame-resistant. Never place trimming near open flames or electrical connections. Do not burn papers in the fireplace. A flash fire may result as wrappings ignite suddenly and burn intensely. Avoid wearing loose flowing clothes—particularly long, open sleeves—near open flames – such as those of a fireplace, stove, or candle lit table. Plan for safety. Remember, there is no substitute for common sense. Look for and eliminate potential danger spots near candles, fireplaces, trees, and/or electrical connections.